Mini Art Journal Page - "Fixing an Un-Liked Page"
Notice this is called 'Fixing an Un-liked Page' and not 'Fixing a Bad Page'. That is because I believe there are no bad pages. Even if it is the ugliest thing you think you have ever seen it still taught you something. It taught you what not to do again. That is how I feel about this page. It's ugly and plain, but at least I know I will never make a page in this style again. I finally decided to re-do this page and I like it much, much better now. I know I covered up my journaling, but it wasn't something I was keeping to document. 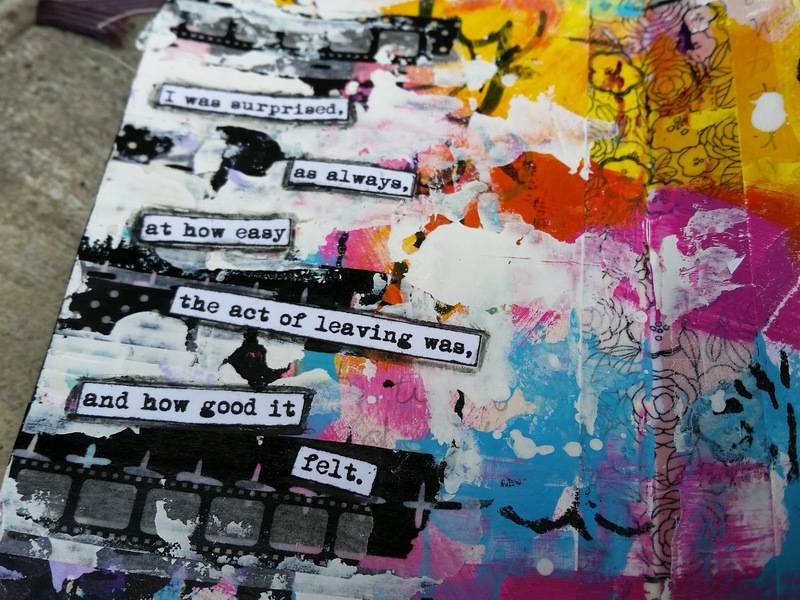 It was journaling just to get some thoughts out of my head, so it doesn't matter that they are covered up now. If you are trying to fix a page of your own and there is a part of it you like, you could just work around that area. You don't have to cover up the entire thing like I did. On the left, I was practicing hand lettering which I am much better at now so it doesn't matter that it got covered up. But I could have just worked around it if I had decided to keep it. 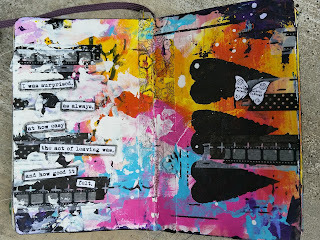 This page starts out with different colored paints, then some washi tape and some stenciling. So, basically my solution to fixing an un-liked page is to cover it up with a crap ton of different colored paints. Haha. I pretty much went at this page like it was a blank surface because I didn't care what got covered up. Our Mixed Media Moods "Trust"
We are back, baby! 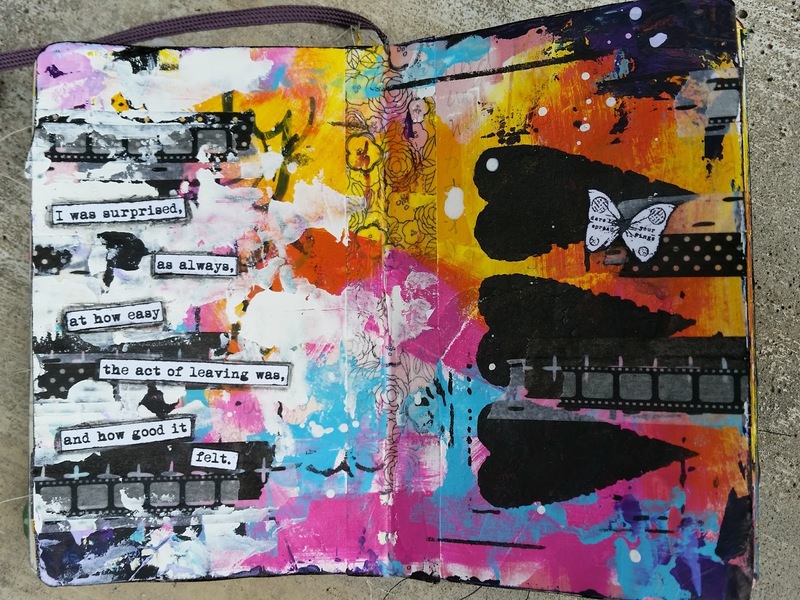 DeeDee and I took a little break but we are back with our monthly collab "Our Mixed Media Moods. Every month one of us creates a mood board and then we create projects based on that mood board. We also create detailed process videos of our projects. Here is this month's mood board! For my project I used a lot of elements from the board. I started with using the color scheme. I also used transparent layers and book text. I used some resin papers and machine sewing. I even tried hand stitching. I stitched my chipboard word with white embroidery thread. I also tried some French knots under my main cluster. It's Halloween time! My favorite time of year! 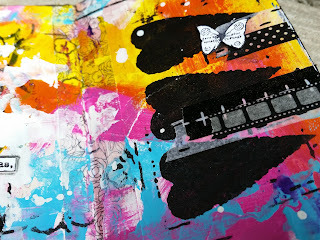 And to celebrate, some of the design team members from Viva Las VegaStamps put together a blog hop. At the end of this post, you will see a list of hoppers. Just click on the first name on the list to go to the next blog! I have the first page in my mini junk journal to share today! It is on ledger paper which I made sure to cover with clear gesso so the paper would hold up. it is a very Dina Wakley-esque page, with a splot of Dylusions Ink and some magenta paint. It came together very quickly, which is exactly what I wanted for this 'art everyday' venture. To see exactly how I made it, you can watch the process video at the end of this post. There is also a complete supply list with links to everything I used on this page.